Walk through any store like Boots and you’ll find a huge array of products: neck creams, roller ball eye creams, toothpastes, hair dye, waxing strips, press on eye shadow strips, pore strips, shampoos, conditioner, toothbrushes, sanitary towels, disposable razors, deodorant…it’s little wonder we generate so much waste each year from our personal care routines alone. Having a low/zero waste personal care routine extends beyond packaging waste and includes the biodegradability of products washed down the plug hole. There are so many ingredients that are extremely difficult (or impossible) to filter out of water and therefore end up as waste products. Companies like Weleda create biodegradable products by substituting chemical cleansers with those made from plant sugars. Using face scrubbies and flannels can cut alot of cotton wool waste. 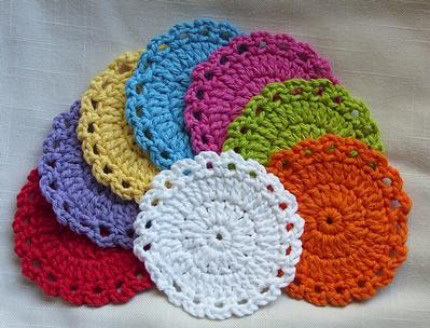 Coloured scrubbies are ideal for removing makeup as they don’t stain. They are easy to wash and hygienic to use as long as you hang them up to dry rather after each use. Bar soaps have much less packaging that pump soaps. Some people feel these aren’t as hygienic as pump soaps but this can be tackled in a couple of ways: put soap in a tray that allows it to dry between uses (usually a ridged bottom), use a soap dish with a lid and look for soaps that contain naturally antiseptic ingredients like lavender, tea tree, eucalyptus and lemon. My favorite bar soaps are Pangea Organics (plantable packaging made from egg crate carton), Dr. Bronners (wrapped in paper) and Copa Soaps (just a brown paper belly band). Neal’s Yard Remedies take back used jars for reuse and recycling and give you 10p for each bottle or jar you return. Making your own products is a great way to save on waste (check out our recipes for some ideas!). You probably already have most of the ingredients you need already in your kitchen. Instead of buying new jars you can use empty jars and products pots you have at home. Trilogy products come in plain brown jars and once the label has been removed, you have a completely plain jar to reuse. 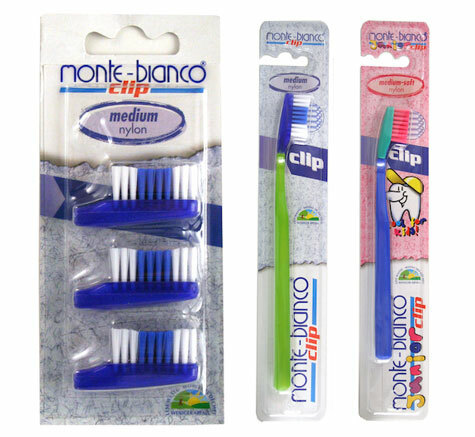 Monte-Bianco Clip toothbrushes have a removable head, so rather than throwing away the whole toothbrush you keep the handle and just dispose of the head each time. These toothbrushes are available with natural (boar hair) or nylon bristles in sensitive, medium or hard. You can buy brushes for children as well as adults. On average, an adult toothbrush costs £2.60 and 3 refills are £3.50 – which makes it cheaper than buying a new toothbrush each time. There are lots of options here. You can use cotton sanitary pads from companies like Drapers, Lunapads, Wemoon and there are also a huge range of handmade cotton pads on etsy.com. Mooncup make soft non-allergic medical grade silicon menstrual cups. Silicone is derived from silica which is one of the most abundant minerals on earth. 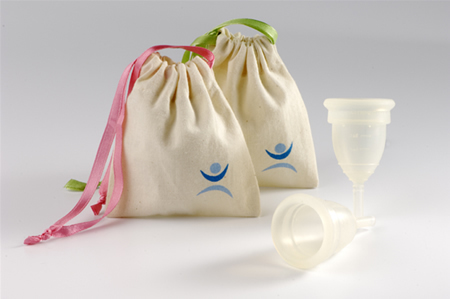 The Mooncup is worn internally like a tampon but collects menstrual fluid rather than absorbing it. Natracare sanitary products are chemical and additive free, and biodegradable and contain only organic and natural ingredients sourced from sound ecologically managed producers. They make towels, tampons, liners, incontinence pads, maternity products and wipes. Their products are: 100% organic cotton, non-chlorine bleached, rayon-free, certified organic by The Soil Association, perfume free, natural materials, plastic free and biodegradable.